INGLEWOOD — In 1988, as a general contractor working on the Sierra Tower in Hollywood, Michael Thomas was probably not expecting a sailboat to catch his eye. But that’s exactly what happened. Thomas spotted the boat — an 18-foot West Wight Potter — in an abandoned parking lot along Sunset Boulevard. “You don’t see many abandoned parking lots along Sunset, much less one with a boat in it,” Thomas said. While the vessel was neglected and in need of some sprucing up, the boat was exactly what Thomas was looking for: something cheap that he could learn to sail aboard. On his last day on the job, Thomas decided to purchase the vessel without knowing anything — or even anyone who knew anything — about sailing. He learned the ropes of sailing aboard his new craft, but it was years later that the vessel’s true value came to the surface. 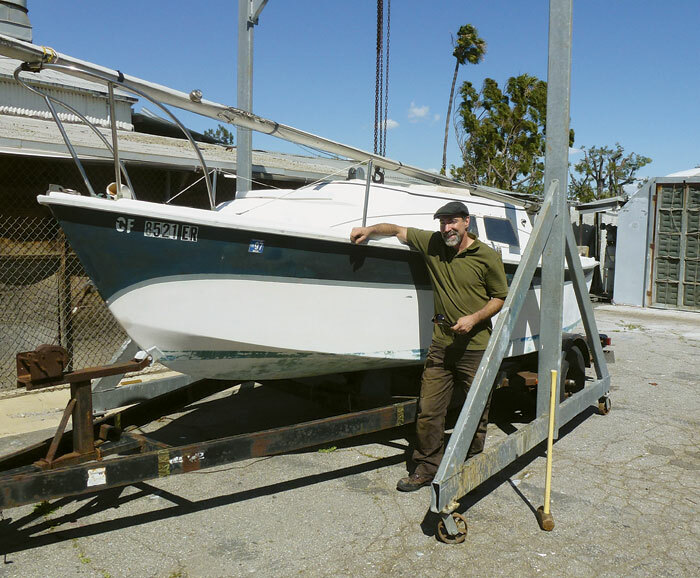 That happened when Thomas contacted Inglewood-based International Marine — the builder of West Wight Potter sailboats — about refitting his vessel. After some initial conversations, the company realized one of its original prototypes — the 18-foot Hull #1 — had been rediscovered. In February, Thomas, who is now living near Morro Bay, commissioned the International Marine crew to restore the vessel to its original splendor, much to the excitement of company owner Ken Lange. “This gives us the opportunity to restore Hull #001, and gives many of the original Potter owners from the early 1970s the chance to join in the project and give us their version of the 40-year-plus history of the boat,” Lange said. The company, launched in Marina del Rey as HMS Marine, has been building West Wight Potter sailboats since 1970. The company’s “trailer-sailer” boats were designed in England, and they have been a mainstay on television’s “The Price is Right, included as showcase prizes for the game show for more than 30 years. The 58-year-old Thomas explained to The Log how he transitioned from boating novice to unique sailboat collector — with just one look. The Log: How did you end up with this boat? Thomas: “Well, it was 1988, and I was working in Hollywood on a Sierra Tower remodel on one of the building’s upper stories there. I drove past this parking lot every day, and back under a tree was that boat. It was looking pretty rough, and full of trash and leaves and things like that. “I think I paid about 1,000 bucks for it. After that, I towed it home and figured out how to set up the rigging, cleaned it out, buffed it up and fixed what needed fixing. This was the first boat you owned? “I had never done any sailing, and I didn’t even know anybody who knew how to sail. So, I bought a book, read up on it, and went out and played on it out at one of the local lakes — Puddingstone Lake, actually. After we had that out a few times, I felt like I knew what I was doing. So, I took it out on the ocean in Long Beach. When did you realize you had a special boat? “I realized when I was cleaning it that it said “Hull #001,” and I thought that must mean something. There’s only one number 1. “To me, it just looked like a basic sailboat that needed work, but the sellers said, “This isn’t just another sailboat, it’s a West Wight Potter: famous and very oceanworthy.” I had never sailed a day in my life, so that didn’t mean anything to me. When did the boat go into storage? What made you want to get it back on the water? “The whole time, I had it on my bucket list that I was always going to get around to doing something with it. Then earlier this year, Potter owner and enthusiast Vin O’Hara spotted my boat while visiting a friend. He asked lots of questions, including “do you want to sell it?” He seemed to be very excited about it being Hull #001. A few weeks later, another Potter owner, Dan Ricker, came by to see her, with even more interest. How much work is needed to get it up and sailing? When do you think it will be back on the water? Aside from its hull number, what makes the boat special to you?